At McDade’s we have professional resources available to help you with your landscape needs. 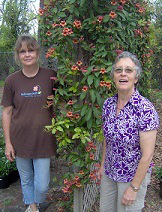 We work closely with two local gardening experts – Carol Harrison and Carin Nichols. Carol and Carin provide a wide variety of landscape services including design and layout, installation, bed preparation, amending soils, planting, bed cleaning, rock work and consultation. Both are extremely knowledgeable about plant materials, are dependable, affordable and have received many recommendations for their work. Both of experts in organic gardening and can provide gardening solutions to homeowner than prefer a natural or balance approach to maintaining their landscape. We also contract with other local professionals for specialized outdoor projects like tree trimming and removal, laying grass, lawn and garden maintenance, land clearance, earth removal and irrigation. For Landscape Services, please contact the Nursery at 903 432-0106 and ask for Stephen. "Finest nursery in Cedar Creek Lake and East Texas"